SFA's Madrigal Singers will present "Music of the Heart" at 7:30 p.m. Friday, Nov. 2, in Cole Concert Hall on the SFA campus. 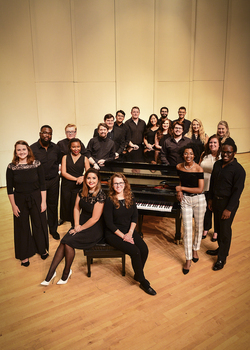 NACOGDOCHES, Texas - The Madrigal Singers at Stephen F. Austin State University will present "Music of the Heart," a program featuring choral music of love and passion, at 7:30 p.m. Friday, Nov. 2, in Cole Concert Hall on the SFA campus. The concert will include works by Morten Lauridsen, Cyrillus Kreek, Clément Janequin, Thomas Morley, John Dowland, Giovanni Pierluigi da Palestrina, Jacques Arcadelt and others. Lauridsen, who has been professor of composition for more than 40 years at the University of Southern California, is the most frequently performed American choral composer in modern history, according to Dr. Michael Murphy, director of choral activities at SFA and the Madrigal Singers' conductor. "His 'Four Madrigals on Renaissance Texts' features a variety of mixed meters, tempos and harmonic structures for choir and flute, bassoon, violin, cello and percussion," Murphy explained. This work was written for one of Murphy's major professors, Rodney Eichenberger. Janequin, a famous Renaissance French song composer, wrote the programmatic piece "Le Chant des oiseaux," or "The song of the birds," to prominently feature onomatopoeic sounds that feature lengthy passages of bird-like calls and chirps, Murphy said. This concert will feature the world premiere of Murphy's own "Ubi Caritas." "This work synthesizes chant inspired melodies, unmetered and metered sections with tone clusters and traditional harmony," Murphy said. "The work features the text that typically commemorates Christ's lesson in charity, humility and friendship."